For years, researchers from the Virginia Tech Transportation Institute (VTTI) have been actively involved in studying the dangers of fatigue within the commercial motor vehicle industry. Results from naturalistic driving studies conducted at VTTI have led federal agencies to create regulations that reduce drowsiness among heavy-vehicle drivers on duty, including new hours-of-service rules mandated by the Federal Motor Carrier Safety Administration (FMCSA). 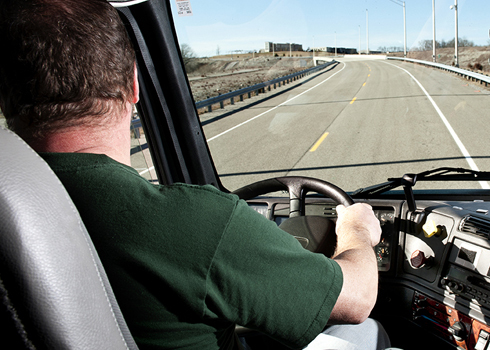 The Institute is now expanding its role in ensuring driver safety by serving an integral part in the launch of the North American Fatigue Management Program (NAFMP) for commercial vehicle drivers and carriers. The NAFMP is a voluntary, fully interactive web-based educational and training program designed to address lifestyle choices made outside of the work environment that may contribute to fatigue, including physical health, the demands of busy personal lives, time-of-day, scheduling and stress. Guidance about health and wellness, time management, vehicle technologies and scheduling best-practices will provide effective mitigation strategies to address fatigue while maintaining a healthy and productive work/life balance. Phase 4 of the program was a 2.5-year endeavor led by VTTI under the direction of Jeff Hickman, group leader of Behavioral Analysis and Applications within the Center for Truck and Bus Safety. VTTI was responsible for developing the 10 instructional modules of the NAFMP: Fatigue Management Program Introduction and Overview, Safety Culture and Management Practices, Driver Education, Family Education, Train-the-Trainer, Shippers and Receivers, Motor Carriers Sleep Disorder Management, Driver Sleep Disorders Management, Driver Scheduling and Tools, and Fatigue Monitoring and Management Technology. Each module was developed by recognized authors with subject matter expertise, and each module is targeted at specific audiences in the commercial vehicle industry. VTTI also created an Implementation Manual designed to provide guidance about applying the program in a truck or bus operating environment. The NAFMP also includes a Business Case with a Return on Investment (ROI) calculator to assist carrier executives in determining the cost/benefit of deploying the NAFMP. The NAFMP comprises a consortium of government, insurance and motor carrier agencies determined to develop an approach to managing fatigue in commercial vehicle operations. The program was field tested in truck and bus operating environments in Alberta, Quebec, California and Texas and was proven to be both feasible to implement in a live operating environment and successful in reducing fatigue in drivers. VTTI conducts research to save lives, save time, save money and protect the environment. Researchers and students from multiple fields are continuously developing the techniques and technologies to solve transportation challenges from vehicular, driver, infrastructure and environmental perspectives. During its 25 years of operation, VTTI has grown from approximately 15 faculty, staff and students to become the second largest university-level transportation institute in the U.S. with more than 350 employees. As one of seven premier research institutes created by Virginia Tech to answer national challenges, VTTI has effected significant change in public policies for driver, passenger and pedestrian safety and is advancing the design of vehicles and infrastructure to increase safety and reduce environmental impacts. In all endeavors, the VTTI community is charged with finding solutions to the greatest transportation challenges facing not only the nation but the world. Those of the Institute are truly dedicating their lives to saving lives.